CLUAS.com's man in China - Mark Godfrey - sends an engaging dispatch on the state of Chinese rock music. Four generations of Chinese rockers and fans celebrated Chinese rock'n roll's 20th anniversary on a stony desert in central China this August. Eighteen bands played the three-day festival, billed as the "Glorious Path of China Rock'n'Roll." Stacks of speakers blasted songs from a well-lit stone stage at the foot of Mount Helan in Ningxia Autonomous Region. The well-policed concerts, near Ningxia's capital of Yinchuan, drew pioneers like Cui Jian and Hei Bao as well as younger stars like Zhang Chu and Luo Qi. There weren't any portaloos but fans camped and traders peddled CDs and t-shirts, creating an atmosphere not unsimilar to well-established festivals in the west. 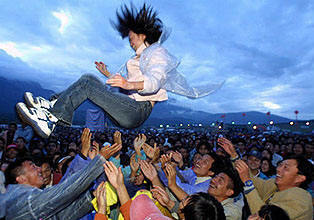 The legendary Cui Jian organised China's first serious rock festival in 2002, with a Woodstock-like rock-out on the mountains of southern Yunnan province. The undisputed godfather of Chinese rock, and originator of the genre opened fifteen hours of shows that ran over three days. Cui Jian, a classically trained trumpet player struck the rallying cry for Chinese rock on May 9, 1986, when, still a relative nobody, he jumped onto the stage at the One Hundred Chinese Stars Show, dedicated to the International Peace Year, at Beijing Worker's Stadium. Dressed in army fatigues and a cloak Cui Jian belted out the song that made him famous: "Nothing To My Name." When he'd finished a stunned audience erupted in a standing ovation and overnight China's youth were playing his songs on beat-up guitars in dormitories and dingy bars. 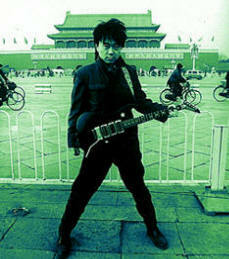 Cui Jian had set Chinese rock'n roll music on the road to respectability. "In contrast to the gauzy romanticism of Chinese pop ballads, his dealt with individualism and sexuality," writes American music producer Matthew Corbin Clark, who's worked with Cui Jian since 1996. Following in Cui Jian's path, bands like Tang Dynasty fused heavy metal with elements of Chinese traditional music, taking their sounds to an enthusiastic Hong Kong crowds during a seminal tour of mainland rock there in 1994. US producer Matthew Corbin Clark followed the Chinese rock scene closely throughout the 1990s, travelling to Beijing in 2000 to record a compilation album with the best of the crop of bands appearing at that time. Spoilt for choice, Clark "?focused on groups with a charismatic leader? I also sought singers who brought something new to the use of Chinese language in song. Finally, I considered rhythm and groove as a central criterion. I was actually very impressed by some of the young drummers I saw in China -- and what a huge change that was from a decade earlier, when syncopated rhythm was as alien a concept in China as McDonald's!" Today Chinese rock fans are spoiled for choice, with local CD shops featuring even the most eclectic records from the West. Local rock fans "?can listen to virtually everything that has ever been produced," says Clark. "It's remarkable to see such a musical shift happening in so short a time." Down in Ningxia meanwhile, kings of the first generation of Chinese rock Hei Bao (Black Leopard), formed in 1987, see themselves as the epitome of the genre that is Chinese rock. "We feel a stronger sense of responsibility when we are making music now," says Hei Bao, the band's lead singer. "Seventeen years is quite a long time for us. It's hard. But hardships drive creativity." Guitarist Li Tong meanwhile is circumspect about the future of Chinese rock'n roll, "I'm more interested in the process of its evolution. As for what it'll evolve into, so be it?" Clues as to Chinese rock's future came at the Midi Music festival in Beijing in early October, when fans crowded to the International Sculpture Park to watch 45 bands play variants of rock music. The festival was organised by Zhang Fan, president of the Midi School, China's first school of modern music and home to 170 students of modern music and production techniques. This year's Midi festival was the best-attended and most successful in Zhang's three years of staging the show. 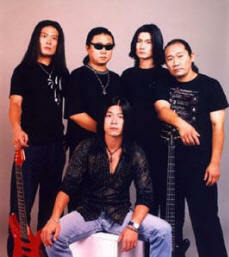 Cui Jian however feels that Chinese rock'n roll has slipped into decline after a golden period in the 1990s. "It was high in the sky. It was an unexpected prosperity. Who knows when we can see another comeback," says the master of the art. Young Chinese are no longer so taken by the riff of a rock guitar, flocking to stadiums instead to see sweeter-sounding pop stars like Hong Kong's Karen Mok or Andy Leung. Cui Jian meanwhile has raised eyebrows by replacing his Chinese manager with an American and touring the West. His music today has an increasingly electronic bent. There are plenty of diehards though. "We are still living the underground life," says Zhang Qian, lead singer of C5, a local group that played the Ningxia festival. In Beijing members of well-known rock bands can earn around RMB500 a night, but in Zhang's hometown Yinchuan, dozens of rock bands struggle for gigs in the city's few bars. "Our life is very difficult," says Zhang, not without a hint of pride. Chinese rock's day isn't done.